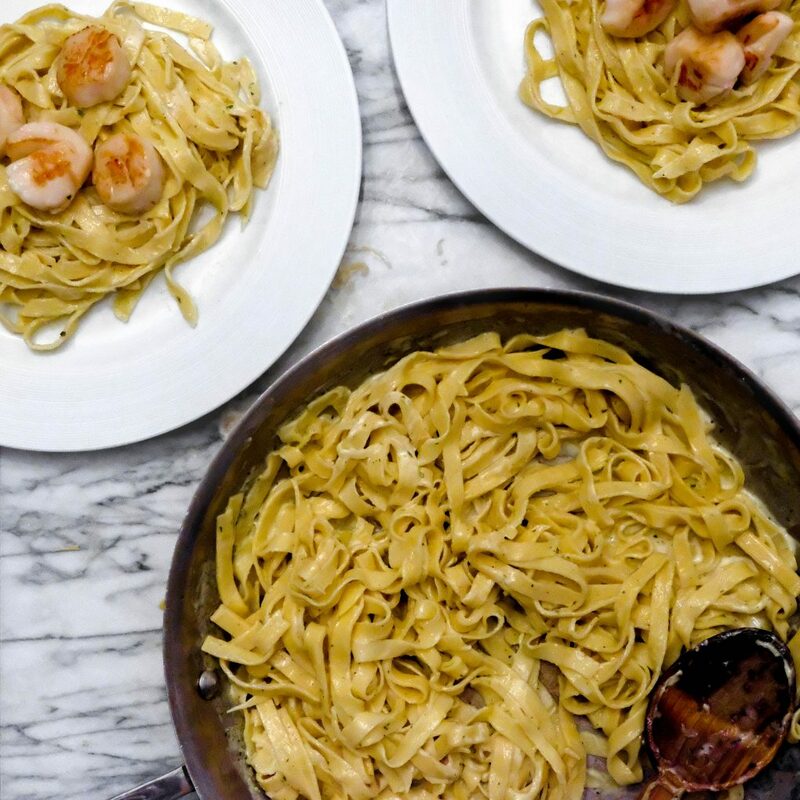 Pasta is one of those fundamental “from scratch” things that can seriously impress your dinner guests and also totally change the game on what you thought you knew. Once you’ve had fresh homemade pasta, it’s really hard to even call that stuff you buy in boxes pasta anymore. I learned to make pasta the way I learned to make bread, which is to say with a few bumps in the beginning. My first bread was like a hard little football shaped rock. My first time making pasta it was similarly hard, which was all the more difficult since I didn’t have a pasta machine back then and so it needed to be (laboriously) rolled out the old fashioned way. The final cooked pasta wasn’t much better. Somehow with both bread and pasta it was only the first time that was a disaster. Every time after was not only passable but definitely edible and quite good in fact. The first pasta recipe I got to know and like was Giada’s recipe found on Food Network. It’s a good recipe and turned out some very good pasta quite a few times. The only hang up I had with it is that it’s measurements are given in volume rather than by weight, which I think is important especially in the early stages of learning the fundamentals like bread and pasta. If you don’t have a kitchen scale then it’s still a good starting place but if you want to really get into the finer points of pasta (or bread) then in my humble opinion a kitchen scale is essential to the learning process. 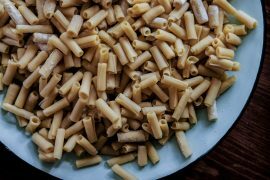 When I got my pasta maker a few weeks ago I decided to look for a more precise recipe so I could control and understand the process a little better. 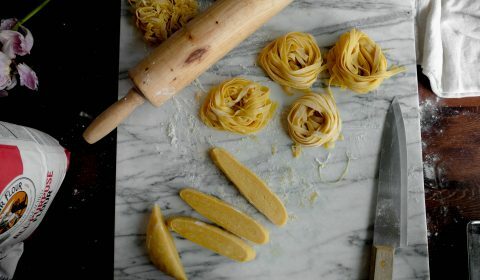 I am forever grateful to the lovely people at seriouseats.com who put together this super comprehensive guide to fresh pasta making, which takes into account so many variables like egg or no egg and water or no water. The results of their intensive research and great documentation is this beautiful and foolproof go to pasta recipe. 2 egg yolks and 1 whole egg for every 5 oz (141 grams) of flour. No water. Isn’t that just a thing of beauty? That’s it. That’s the whole recipe. It doesn’t get simpler than that. 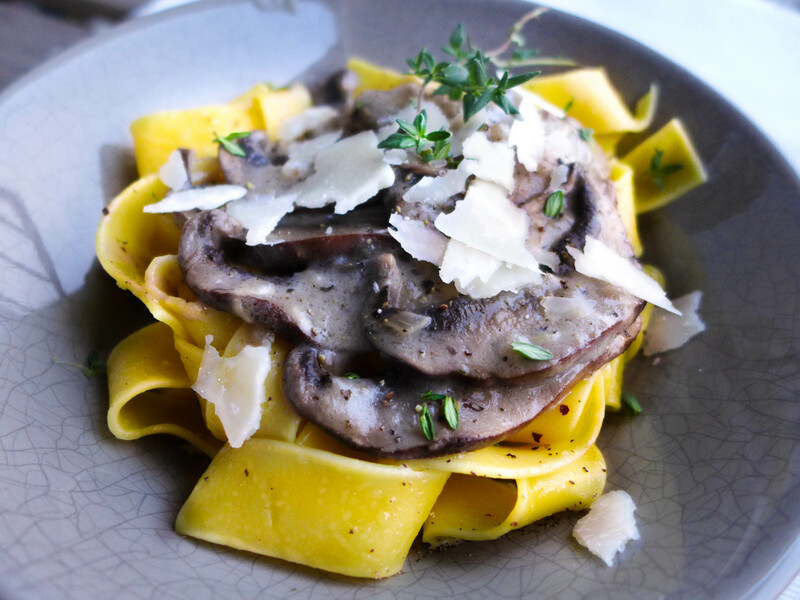 Each time I’ve made this I doubled the recipe, which made enough pasta for 3-4 very generous servings. 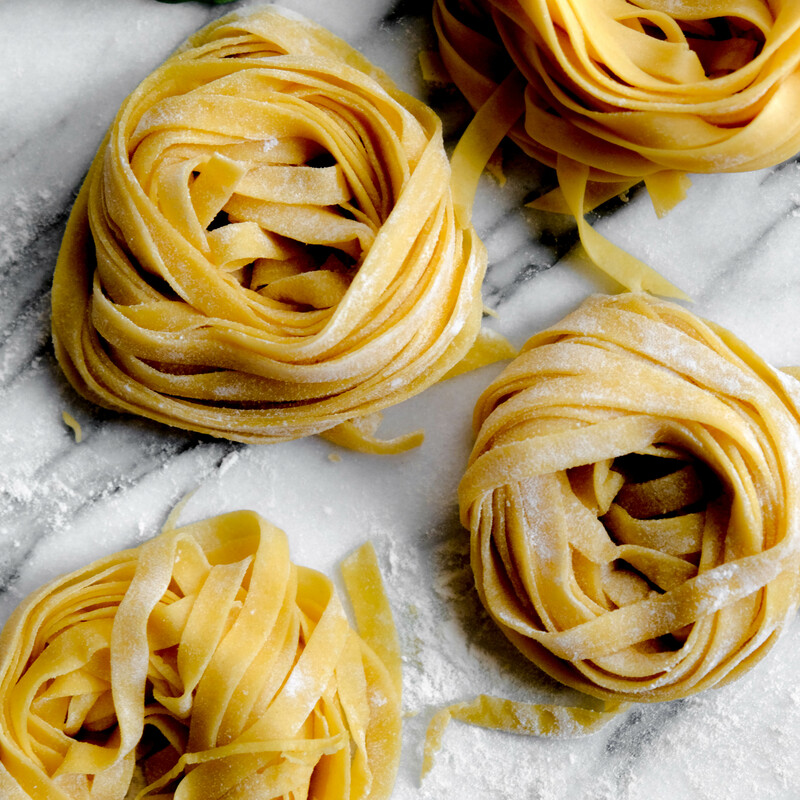 Pasta rolling machine (optional but recommended) – substitute rolling pin. As I mentioned above a kitchen scale is not essential but very good to have when learning about the nuances of pasta and bread. Likewise, a pasta machine isn’t absolutely necessary and can easily be substituted for a rolling pin but I think it produces much better results with less effort. More on the pasta machine below. Italian and French cuisine are characterized in part by their very simple preparations executed with utmost attention to detail. So of course the first step to good pasta is good flour and good eggs. What’s also important is good technique, which can be summarized mostly as a bit of patience. Most recipes ask that you make a little mountain of flour with a hollow in the middle where the eggs are placed. A fork is then used to mix the eggs, pulling flour in slowly as you go. I’ve done it this way on a marble pastry board (as shown above) but I’ve also done it just in a bowl (which makes for easier clean up) and honestly it comes out virtually the same as far as I can tell. The recipe I followed is very clear on the point of no water. Unless your dough is so dry that you’ve been kneading it together for 3-5 minutes and it’s still a pile of bits then you shouldn’t add water. I haven’t had a problem so far. 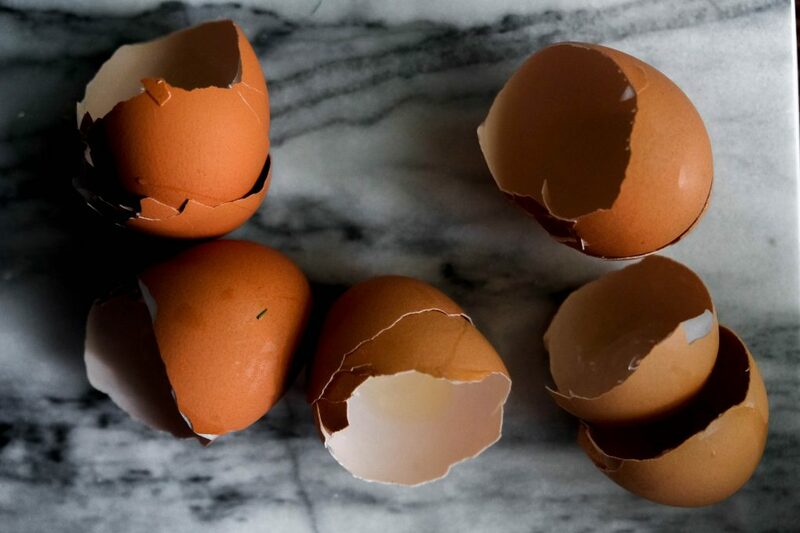 It may not seem like enough but the amount of liquid in the eggs is enough to hydrate the flour. Whether you add salt to the pasta dough is up to you. I’ve done it both ways (with or without salt in the dough) and it seems indistinguishable since the pasta is boiled in salted water. Juices: I’m planning to make some coloured ravioli soon with the help of some beet juice, spinach juice, and maybe carrot juice. About a tbsp of strained liquid should be enough to colour the pasta without upsetting the liquid balance too much. 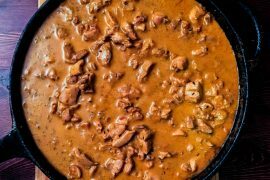 Spices & seasonings: Of course you can add any spice or seasoning that you like. Dried oregano comes to mind but I think it’s pretty flexible. Basil: A few times I’ve added basil leaves during the rolling out process. I wish I had taken a photo. I will in the future. I think it gives the pasta a nice basil flavour and makes it look very pretty. The basil stretches a lot during the rolling and by the end you have very large green leaf motifs. I usually add it just after the first setting (so around 1) but you could also add it at a later stage in the process (maybe at 5 or 6) for smaller basil motifs and see how that works. More on rolling out below. After the initial mixing pasta dough (like bread dough) likes to rest covered so it doesn’t dry. I like to cover mine with a layer of plastic wrap and then a cloth. There’s nothing worse for dough than it drying out before you’ve had a chance to use it. The resting period is so that the flour can fully hydrate (which aids gluten formation) and also so the dough has a chance to soften, which gives it that beautiful spring and body. If you try to roll out pasta dough too soon after mixing, it will snap and break because it doesn’t have sufficient elasticity. About 20 minutes should do it. Before when I would make pasta without my pasta roller I rolled out the dough with a rolling pin. I found this to be very physically demanding, so much that I didn’t want to make pasta too often. It’s possible I wasn’t letting the dough rest sufficiently and I will have to try one day to see. A more important point may be that the roller makes the dough much thinner than I’ve ever made any dough, from pie to empanada to roti and of course pasta. Doughs can be hard (i.e. 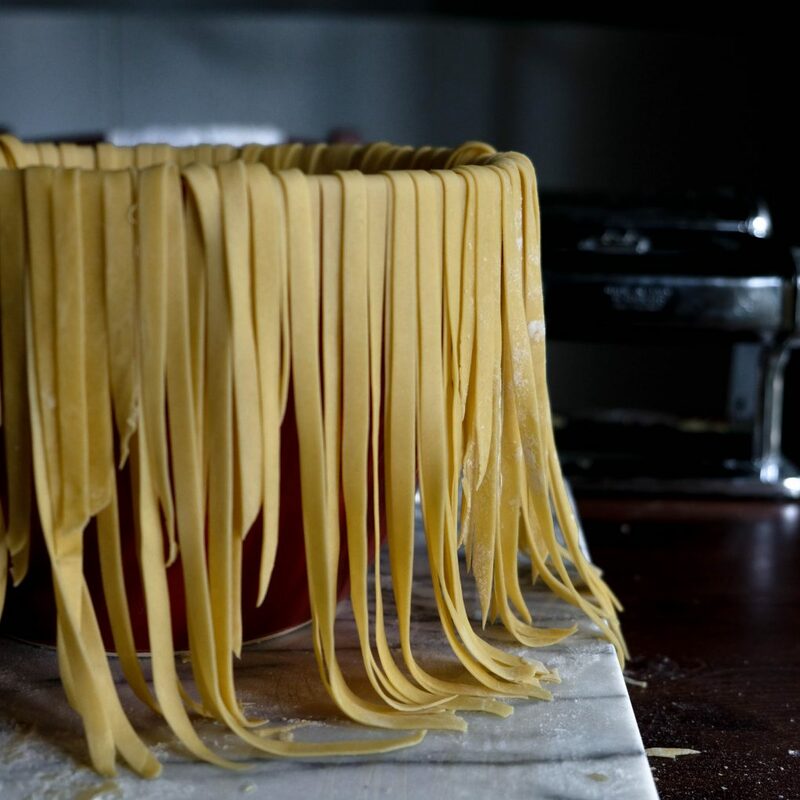 with gluten) which makes lovely elastic doughs like pasta or wonton, or they can be short (i.e. 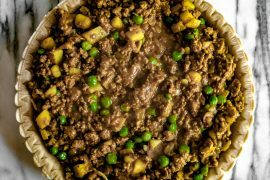 ideally no gluten development) which makes crumbly and tender pie crusts and tart shells. For pasta we want the gluten, but the gluten also fights back. I very much recommend a pasta roller if you can afford the cost and the space in your home and plan to make pasta often. The one I bought is the Atlas Mercato 150mm manual crank machine. I read some reviews before buying which suggested it was the best one but since I’ve had it I’ve noticed it literally everywhere. It seems to be the roller of choice for bloggers and chefs alike. It’s also the machine seriouseats.com used in their pasta experiments. Every time I see this I’m more convinced I made the right choice without even having all the information. So lucky. 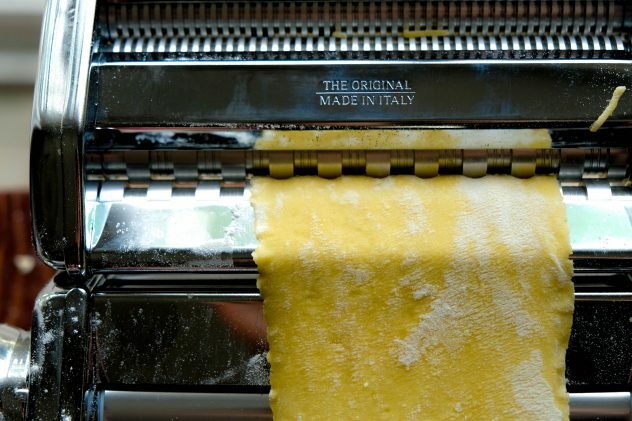 After the dough has a chance to rest you can begin working on it by cutting it into pieces to be fed into the pasta roller on the widest setting. You should do this at least 2-3 times per piece of dough (though some suggest up to 10), folding it and returning it into the roller on the widest setting each time. This process is called laminating and it helps gluten formation which makes for better pasta texture. When you’ve finished laminating a piece of dough I recommend putting it under a cloth again while you work on the rest so that it doesn’t dry. It’s best not to put the pieces on top of each other or they will stick together. 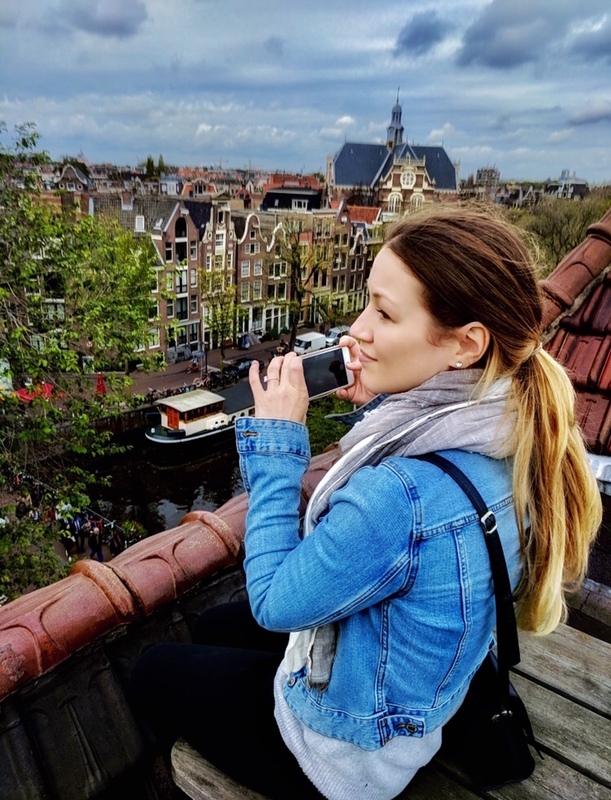 These are best practices that I don’t always follow myself (to save time and space) so I work quickly to prevent drying and gently pull the pieces apart if they’ve stuck together. The choice is yours. Definitely don’t do this with thinner dough because it’s too fragile to pull apart. 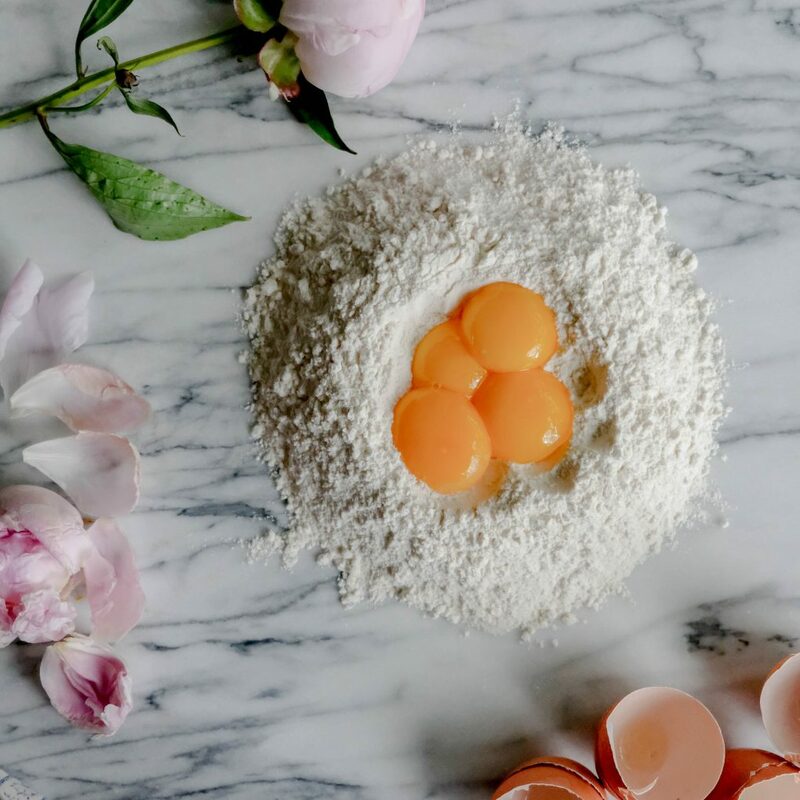 If your flour and egg didn’t mix quite enough you may notice dry pieces, chunks or uneven texture when you first cut the dough. Usually this can be remedied by a thorough lamination process. If my dough is dry and uneven I laminate up to 6 times and it usually does the trick. Once you’ve laminated the dough start again from the first piece feeding it through the machine from widest setting (0) to thinnest setting (9). Sometimes I skip a few of the steps, which I think makes the dough crimp weirdly. It’s never caused a big problem but the choice is yours how to proceed through the steps. Definitely more patience makes better texture. Since the dough dries so fast (especially when it’s rolled out) what I like to do is to roll out each piece all the way from thickest to thinnest, then shape it or cut it into my desired form, and put it properly to dry before I move on to the next piece of dough. That’s just my process to deal with fast drying dough. You may find one that suits you better. The Mercato machine has 2 cutting attachments that make fettuccini and spaghetti. 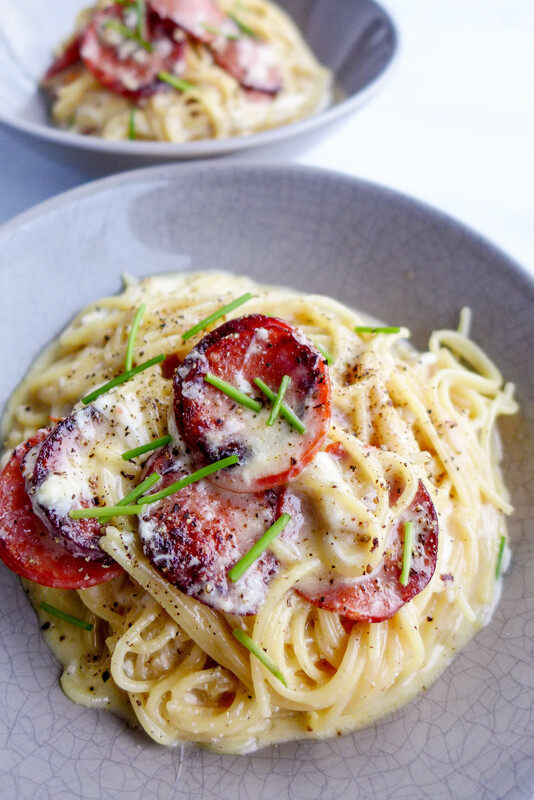 I’ve made both and I think the spaghetti is slightly harder to work with but also my favourite as it soaks up so much sauce and has such a hearty mouth feel. You can also make different kinds of pasta once the dough is rolled out. 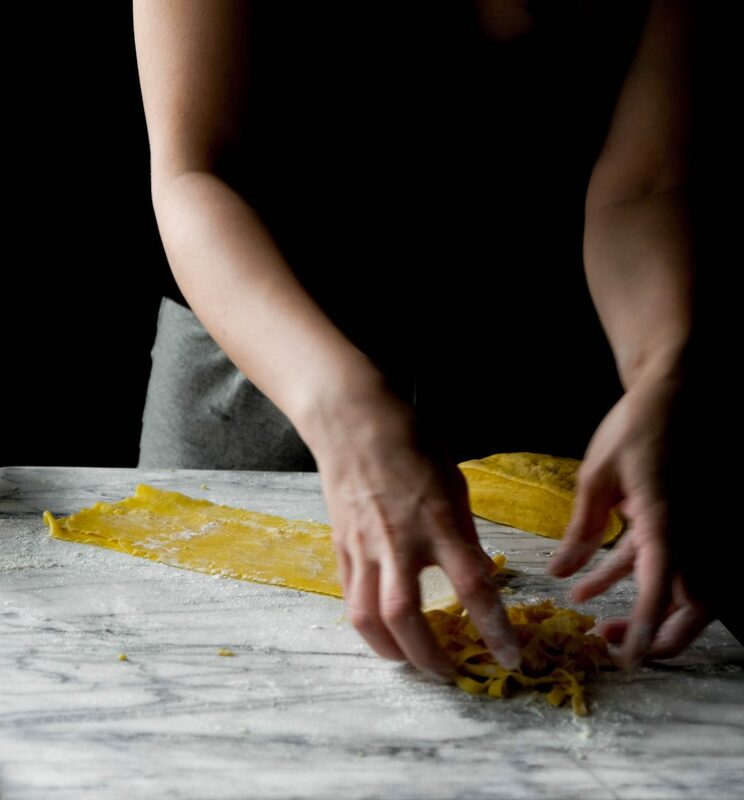 You could cut it into 1 inch strips for pappardelle, or into bigger pieces for lasagna, or even into tiny squares for macaroni (see Handmade Macaroni From Scratch.) I think I’ll need to write a whole post just about pasta shapes. Coming soon I promise. The little baskets I made from the fettuccini in the feature image for this post look very cute but I’m not sure it’s the most practical solution. When the dough dries in this shape it can adhere together, which makes for clumpy stuck together pasta once it’s cooked. When I made these cute little fettuccini baskets I ended up re-rolling all the pasta I had rolled and cut because it was sticking together so badly. I know a lot of very professional chefs do it this way and maybe with a good dusting of flour it won’t stick but in my experience this is probably a pro move not the best for beginners. A friend’s Italian grandmother dries her pasta on a cloth hanging off the edge of a table. Another friend dries hers on a broomstick suspended between two chairs. 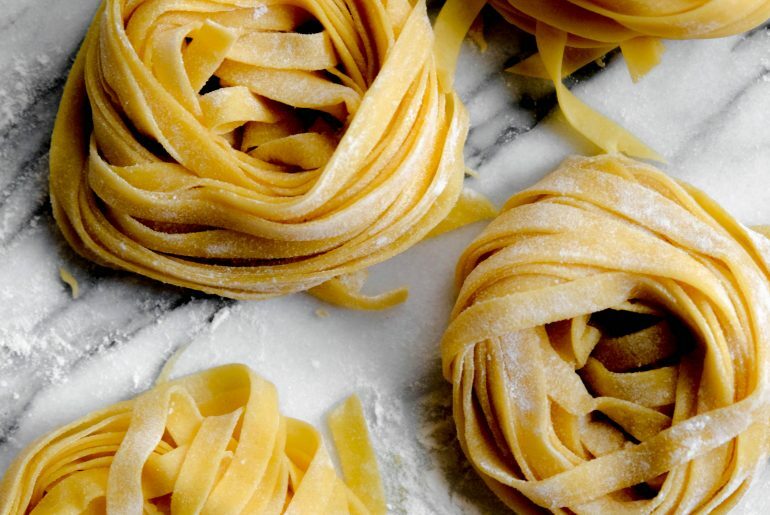 Fresh pasta cooks in boiling water very quickly. 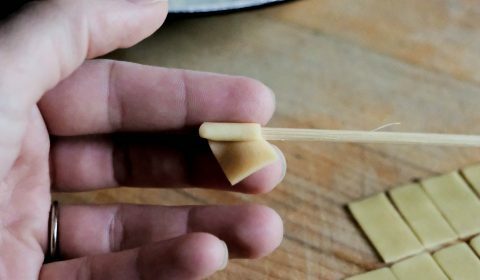 Depending on the shape about 3 minutes should be enough for perfectly al dente pasta. I recently heard a chef on Chopped say that fresh pasta cooks in 45 seconds, but that hasn’t been my experience. Ultimate test is the taste test. Shown here is fettuccini in a simple homemade alfredo sauce with seared scallops. This was our very first pasta after buying the pasta machine. I hope I haven’t missed anything and that this has been helpful. Please comment with any questions below.